This is the third instalment in the process behind a composite image. The first part “Getting set up” can be found here and the second instalment “Shooting the background” is found here. The actual shoot took place on August 25th but other commitments have not allowed an earlier post. The shoot involved Megan as my willing model and also my daughter Samantha acting as assistant (and behind the scenes photographer). Despite the fact that this was to be a composite image I was actually trying to achieve as much as possible in camera. There were basically three shots to be done on the day namely. Because I was not sure what would be the best angle to shoot from we were going to recreate the shots twice. I had factored this into the shots I had taken earlier with backgrounds. As I knew that I was not going to be using the actual background I set up a large blue tarpaulin to act as a blue screen for me. This was to make the process of cutting the subject out easier but it does rely on having a reasonable consistent colour. Because the area was actually in shade I knew that this was not going to be the case so I place one of my lights to light this background. It was angled so that it would not spill light onto my model. My main light was used a beauty dish over which I had placed a yellow gell to give me a warmer light. I placed this light directly in line with the sun so that the images had the same lighting location as the backgrounds I had shot previously. For the second shot I had hoped to trigger both the main lights and the speedlight at the same time but unfortunately one of my triggers refused to work so they had to be fired separately. For all these shots the camera was set on a tripod which was set at exactly the same height as the park backgrounds had been shot at. This would ensure that all the angles would be consistent. Fortunately this was the only technical issue that we ran into on the day. The biggest challenge that we had to face came with shot three. 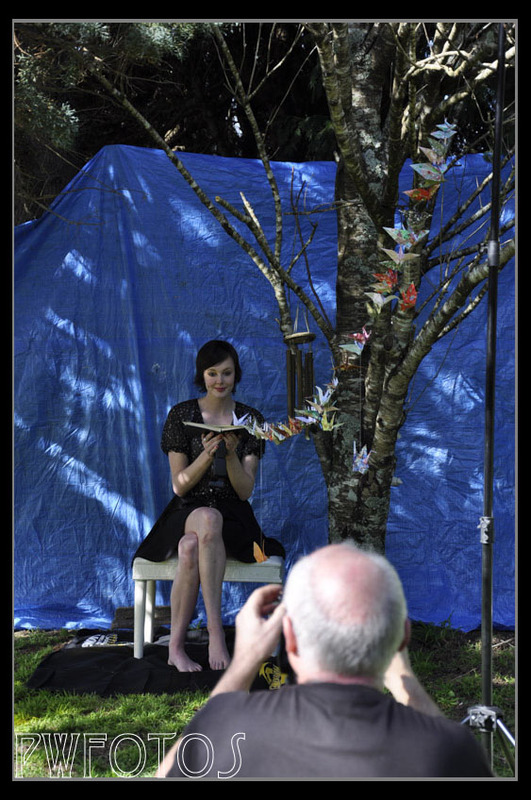 The paper cranes had been strung together on a single wire and though we tried several approaches to attach them to the book and various light stands they proved difficult to handle, and the results were not exactly what I was looking for, but there was the hope that it would work in post. Later that night I downloaded the images, chose what I considered to be the best and started to prepare a rough composition. I think that this was a bad move because I was too tired and so I made mistakes that meant that two days later I essentially started again. What was confirmed though was that the head on angle was the best for the images, that the tree in my garden was not working and that I would use all of the backgrounds trees, and that the cranes had not photographed well at all. The conclusion was that the process needed more image and that I needed to shoot individual paper cranes and composite them. So yesterday I set up to shoot the cranes. 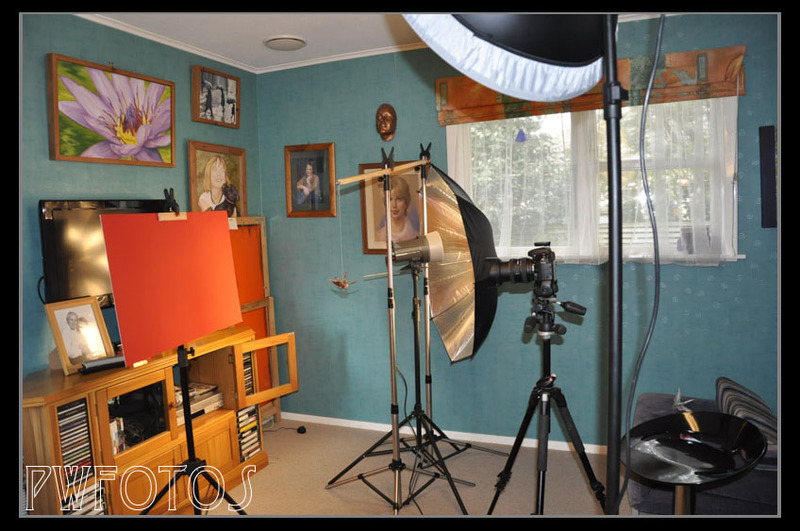 I used two background supports and balanced a length of wood on it from which I which I could hang a crane. Again the main light was a beauty dish positioned in roughly the same direction as the week before. This time I used a piece of red card as the background which was light with a second light with a bounce umbrella. The camera was set on tripod at roundly the same height as the weekend. I allowed the crane to rotate on their strings and also swung them a little. That way I would get different angles to use with the same lighting. Finally I felt that I have all the elements for the final image to be built.